Breeds Home > What Breed Is My Dog? What is the Purebred Certification Test? 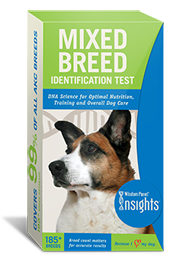 The Purebred evaluates the genetic patterns within your dog compared with the genetic signatures observed in our database of known purebred dogs. 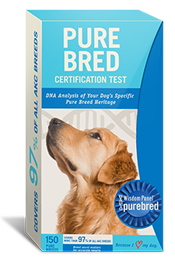 The Purebred certification test can help answer your questions and satisfy your curiosity! Are you wondering if you have a purebred dog? Do you think you have a purebred, but donâ€™t have pedigree documents? Once you know if your dog is really a Purebred Dog, be sure to check out our Purebred Dog Breed List for more information! Where does Buddy get his curly tail from? Why does he love digging holes in the backyard? Could I be doing more to make him happier and healthier? Your dog may not be able to tell you the answers â€“ but his DNA can. Wisdom Panel Insights, the most comprehensive mixed-breed cheek swab DNA test on the market, can help explain a mixed-breed dogâ€™s ancestry. Over 25 million mixed-breed dog owners know their dogsâ€¦but not as well as they could. With the simple swipe of a cheek swab, Wisdom Panel Insights can determine the ancestry of a mixed-breed dog by testing for more than 185 breeds, the largest database on the market. Within three weeks, dog owners will be e-mailed an official Ancestry Report that reveals the dogâ€™s genetic background. What will my dog's report tell me? Parent - A breed that represents approximately 50% of your dogâ€™s DNA. You are likely to see the most physical and behavioral traits from this breed. Dogs with mixed-breed parents will not have a breed represented at this level. Grandparent - A breed that represents approximately 25% of your dogâ€™s DNA. You may see some physical and behavioral traits from this breed. Dogs with a very mixed ancestry may not have a breed represented at this level. Great-Grandparent - A breed that represents approximately 12.5% of your dogâ€™s DNA. You are unlikely to see many traits from this breed unless they are dominant. When you understand your dogâ€™s natural tendencies, you can tailor a training, exercise and nutrition program to his needs.